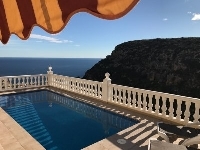 VILLAS AND APARTMENTS TO RENT IN THE VALENCIA REGION OF SPAIN, SPAIN. Welcome to our selection of holiday homes to rent in Valencia, Spain. Valencia is the easternmost region of Spain and lies along the coast. The region is rich in history dating back to the Roman period and has saw many significant events take place since then. There lies many historical buildings throughout the region of various architecture from the different ages. Valencia is also a very beautiful area of Spain as it is full of flowers and a wonderful landscape with popular beaches with golden sands and calm waters. Valencia is an ideal location for a holiday as it caters towards a variety of different tastes. Whether you enjoy a busy party atmosphere going to bars and clubs in the city, spending hours just shopping in numerous shops then getting a tan on the beach under the hot sun. Or if you are after a quiet relaxing holiday in the stillness of a beautiful countryside amidst a picturesque village taking in the traditional Spanish culture then there are several locations that are ideal. Perhaps you're looking for a wholesome family holiday location that would keep all members of your family entertained with shows, events and sporting activities? For the sports enthusiast there are every kind of watersports and the area is well served with golf courses with Villamartin and Rojales being two of the better known. The Costa Blanca in Valencia is one of the most popular destinations for holidaymakers going to Spain. There are a wide variety of places to visit from the Northern areas of Gandia and Oliva with their orange groves and spectacular mountain backdrop and having excellent sandy beaches. Further South is Denia, which has a marina and a port from where you can catch a ferry to Ibiza and Mallorca. Inland is the Jalon Valley famous for it's wine production. Benissa and Calpe are further south; the famous rock off Calpe is called the Penon de Ifach with wide sandy beaches either side. South is Benidorm which is the largest resort on the Costa Blanca with plenty of shopping, cafes, bars and restaurants. Like everywhere in Spain, Valencia has its own festivals too - from widespread festivals that focus on religious traditions or just to put on entertainment for the residents and visitors to the more localised festivals unique to Valencia that commemorate a significant event in that particular town's past; all the festivals are enjoyable to participate in and are well worth visitors on holiday attending. Spain takes its festivals very seriously and are expertly organised and contributed to by the townsfolk. Valencia also prides itself on its dedication to the arts. There are many talented people residing in Valencia from painters and architecture to performance arts such as music, theatre and dance. If you stay in Valencia, you may well see their beautiful work be it during a performance or just upon one of the many ceramics that capture the spirit of Valencia that the region is well known for. Looking for self catering holiday accommodation in Valencia? Then below is a selection of apartments in Valencia and villas in Valencia that can be rented direct from their owners. You can either click on each listing for further details or you can use our search engine on the left if you are looking for something in particular.